Another first by Ground Zero Electrostatics! Ground Zero's hot new product that eliminates user-induced static discharges to all sensitive electronics including file servers, key computers, telephones, Copy Machines and sophisticated Audio Equipment. The VersaStat 2000 makes any chair mat static free! Drains the charge from carpeting. Includes our Patented Static Collection / Display Technology. Discreet, Powerful, Patented. The VersaStat 2000 installs in minutes, drains the static in seconds. 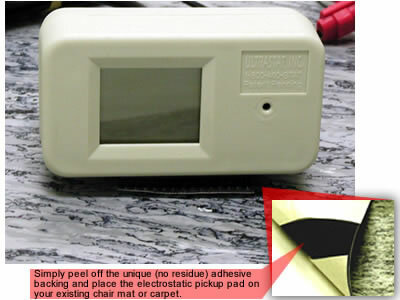 Simply peel off the unique (no residue) adhesive backing and place the electrostatic pickup pad on your existing chair mat or carpet. Ground the patented electrostatic collection / display unit (sounds complicated but it's easy and no tools required) and user induced ESD problems become a thing of the past. Comes complete with a bottle of UltraSpray, perfect for cleaning your chair mat or for added effectiveness when using the VersaStat on carpet. VersaStat's discreet sized electrostatic pickup (18" X 12") and thin, low profile doesn't get in your way. Roll on it with chair casters, beat on it with foot traffic.